Many home theater A/V receivers include multizone functionality, which lets your receiver control your home theater and provide music to multiple rooms. A multizone receiver is a good way to get started down the whole-home theater path. Simple multizone receivers: These receivers have a pair of stereo audio outputs (not speaker connectors or amplifier channels, just outputs). These outputs enable you to run an audio cable to another room and connect to a separate amplifier and speakers in that room (or to a pair of active speakers that have a built-in amplifier). The key feature to look for here is that this second zone is truly a second zone. That is to say, the receiver lets you send a different audio source to the second room, not just the one you are playing in the home theater. 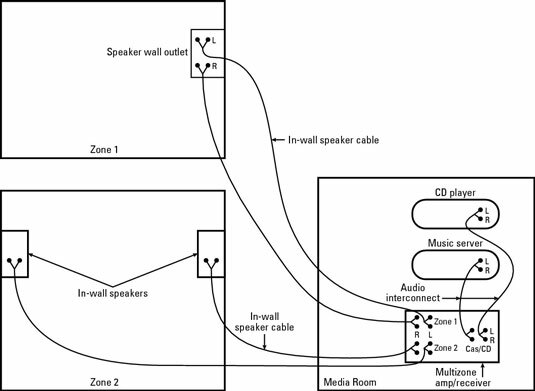 Follow this typical setup for a simple, multizone audio network. More sophisticated multizone receivers: The more complex multizone receivers include extra built-in amplifiers (so you don’t need an amp in the extra room) and with extra zones (so you can send different audio sources to a third or fourth room). You may even find multizone A/V receivers that send out a composite video signal. With this signal, you can watch the video from a home theater video source elsewhere in the home.